Hand-painted gem tintype. Unknown photographer. Date unknown. Sheila Masson Collection. The application of paint to this unmounted gem tintype reveals a sense of humour not typically seen in Victorian portraiture. 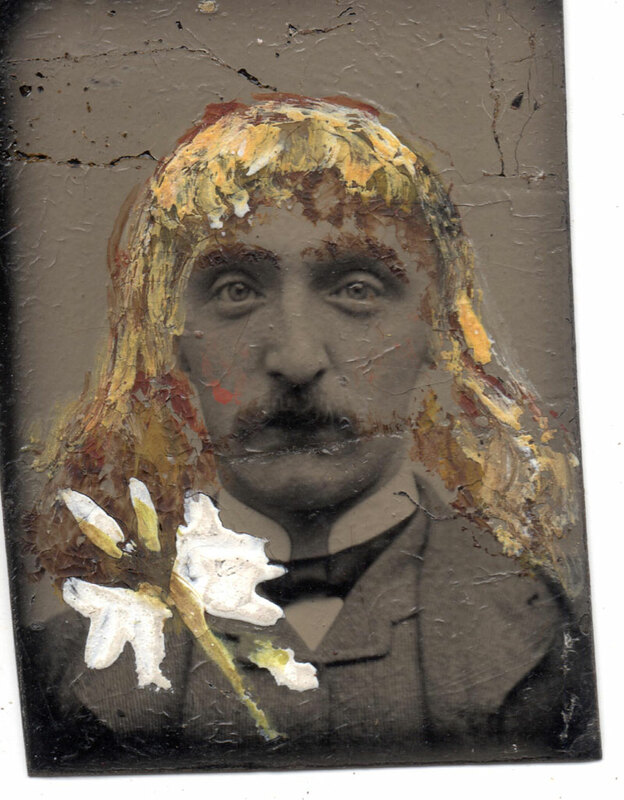 The flowing golden locks and what might be a flower or a winged insect on the lapel create an amusing miniature portrait, but was this addition made by the subject himself or by someone else? Almost 160 years since its invention, there are still no major publications written exclusively about the British tintype, although there are numerous titles discussing their American cousins. Even books focussing on historic photography at the British seaside often ignore them despite their considerable connection. Similarly British tintypes are rarely exhibited except as side notes to other techniques, although Photography – A Victorian Sensation exhibition at the National Museum of Scotland in Edinburgh included a substantial selection of tintypes, both from the Bernard Howarth-Loomes collection and also from the National Media Museum in Bradford. In contrast, in 2008 the International Center of Photography in New York staged a dedicated exhibition entitled America and the Tintype which featured several hundred examples from both the Permanent Collection of the I.C.P. and from private collections. Furthermore, the International Museum of Photography and Film in Rochester, NY, includes a prominent display of tintypes directly adjacent to a calotype by D.O. Hill and Robert Adamson, firmly acknowledging the tintype’s relevance in American photographic history. 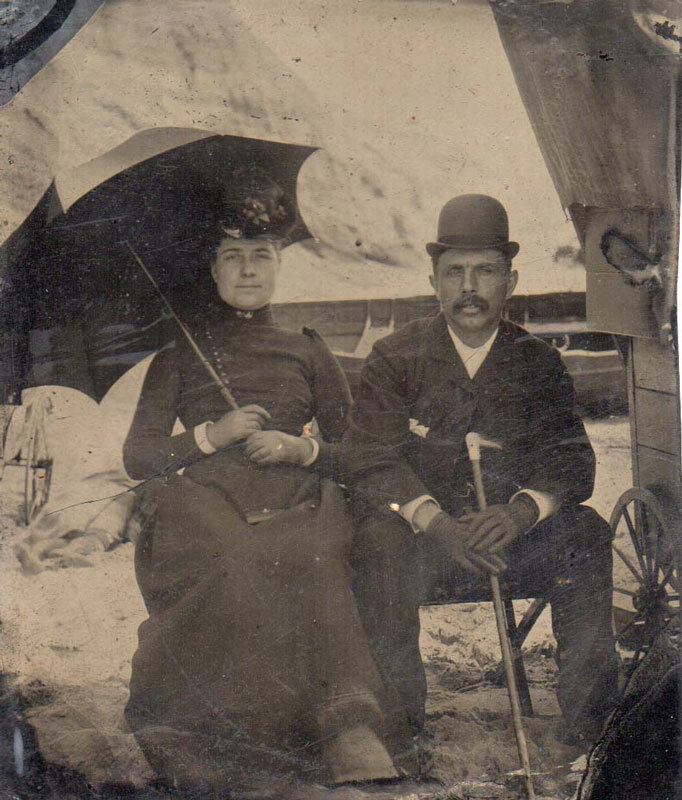 Although the setting and pose of this seaside portrait are commonplace, it has one very unusual element in that the names of the sitters have been faintly scrawled in wax pencil on the back of the plate: “Jacob Tweed & Madeleine his wife”. And as seen in other beach photographs, the wooden pushcart parked next to the couple most likely belongs to the photographer. Although tintypes enjoyed huge popularity in the United States after their introduction in the late 1850s, they never achieved the same acceptance in Great Britain. The British photographic establishment quickly rejected the process and ignored its commercial practice, with one individual describing it as having “such a bilious tint” and being “unworthy of the present times”. Even in the 20th century tintypes were derided as “these hideous, cheap-looking pictures” by eminent historians Helmut and Alison Gernsheim and this dismissal within British photographic history has continued to this day. 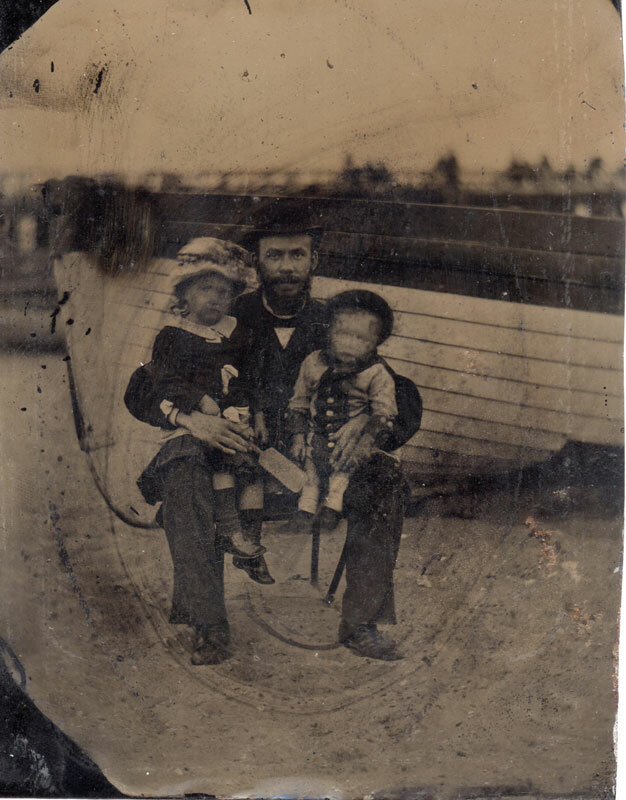 Tintypes (or ferrotypes, as they are also known) are created by coating ‘japanned’ or varnished iron plates with liquid collodion, which can be sensitised, exposed, developed and fixed on the spot in a light-safe tent or cart or in a permanent studio. The relative simplicity of the process enabled itinerant photographers to use portable set-ups which could be quickly moved to a new location in order to find new customers. Although as historian Paul Cox describes, tintypes were “messy, smelly and cumbersome” for the photographer, with exposures lasting from just a few seconds to almost a minute, sitters could receive their portrait in minutes from start to finish. Unlike the wet collodion ambrotype and the more expensive daguerreotype (both of which involved using fragile glass plates) the robust metal plates on which tintypes were made could withstand rough handling and therefore could be mailed across large distances. This durability was exploited by American photographers and their clientele through the outbreak of the American Civil War and the expansion of West, where tintypes flourished and were made for customers of almost all backgrounds. Three women in woollen hats. Unidentified photographer . C.1890s. 6th plate tintype. Sheila Masson Collection. 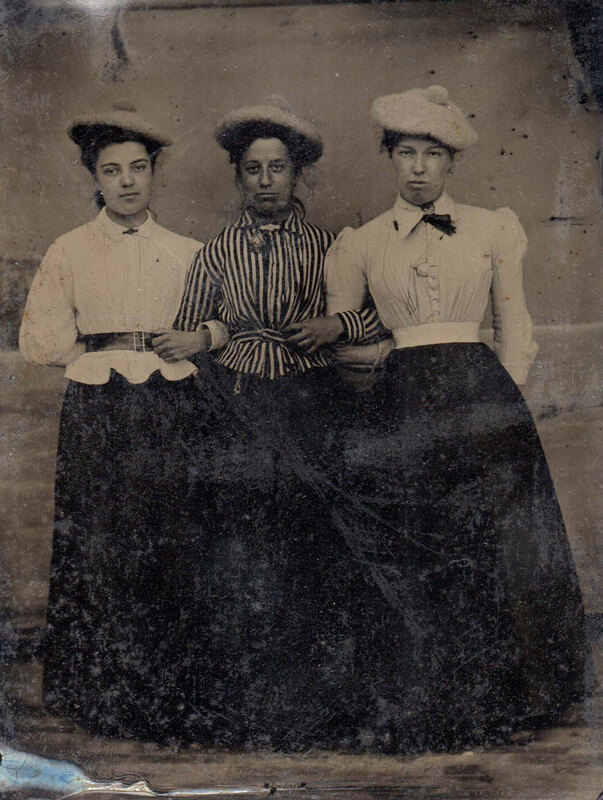 Possibly taken in Scotland, these three young women sport distinctive woollen hats and very similar outfits of belted shirt and floor-length skirt ensembles. In Victorian Britain however, tintypes were chiefly purchased by the poorest of the working classes as their only affordable option for photographic portraiture. The middle classes and the wealthier working class were already served by the more expensive carte-de-visite portrait and the tintype was typically disregarded by them except as a novelty to be purchased at the seaside. In fact seaside images are the most easily identifiable of British tintypes, which frequently lacked studio branding and whose makers remain anonymous. Truthfully, the technical and aesthetic quality of the average British tintype often pales in comparison with their American equivalent. The focus is sometimes soft, pour marks or fingerprints are often apparent on the plates, the corners are roughly clipped and the edges are uneven. However, despite being overshadowed by their American counterparts, British tintypes deserve a re-examination in order to add important material to both the history and the historiography of photography. The continued and unchallenged contempt towards tintypes, their producers and consumers ignores significant contributions to social and photographic history and also displays a disregard for the visual records of the underclasses. 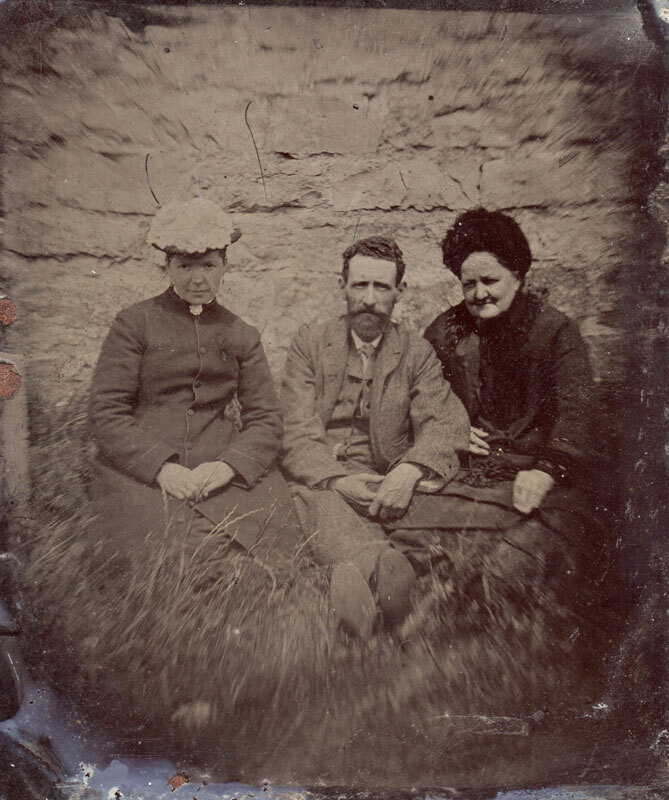 British tintypes can provide us with a glimpse into an under-researched and inconsistently recorded social experience and furthermore they provide a platform for people who were frequently voiceless in their own era. A large family group poses in front of a painted backdrop depicting the Forth Rail Bridge, probably photographed by Peter McGill at or near his studio in Hawes Pier, Queensferry. The unusual pitched roof and almost tent-like awnings might suggest that this was a temporary studio or possibly just an insubstantial permanent one. Repeated studio portrait of a man.Unidentified photographer. Date unknown. Uncut gem tintype. Sheila Masson Collection. This uncut and unmounted triple portrait shows three different exposures made in a studio setting. Typically this size of image would have been cut and mounted with a carte-de-visite-sized paper casing, but this might have been the photographer’s test exposure. Large family group on a pebble beach. Unidentified photographer . Date unknown. 6th plate tintype. Sheila Masson Collection. 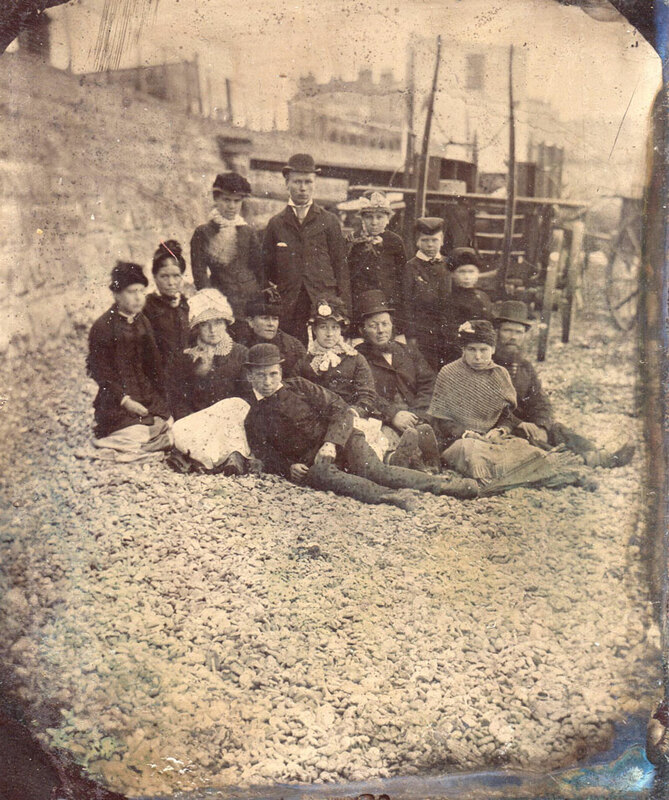 This beach photograph of a large extended family was most likely taken on the south coast of England where tintypes were made in abundance. Behind this group are visible the curved shafts of a horse-drawn wagon and other large wooden vehicles. Coachman. Unidentified photographer . Date unknown. 6th plate tintype. Sheila Masson Collection. 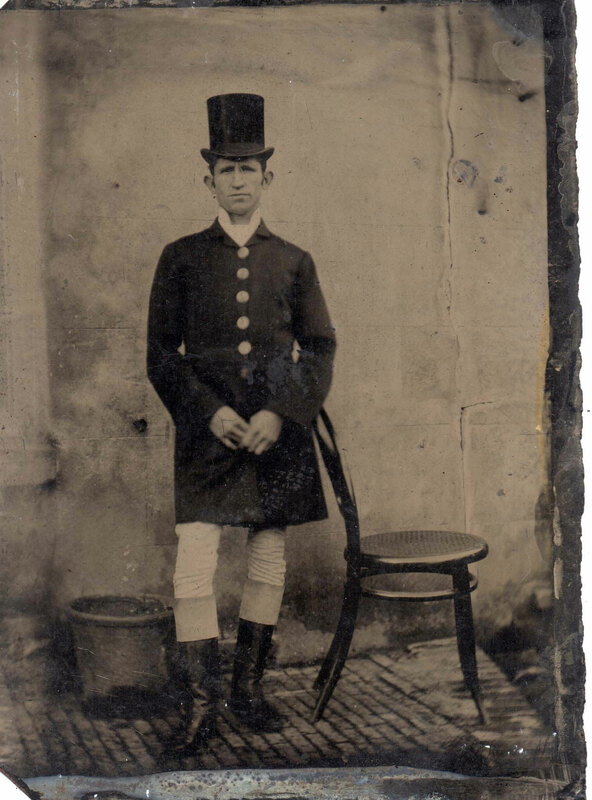 In a close approximation to an American “occupational” tintype, this coachman has been photographed in his working attire of a smartly buttoned coat, two-tone riding boots, white riding breeches and a top hat. The stone wall, bricked floor and bucket illustrate his working environment although the slightly incongruous chair might have been brought in as an ad hoc support to keep the coachman in a motionless pose. Family portrait with painted backdrop. Unknown photographer. Date unknown. 6th plate tintype. Sheila Masson Collection. 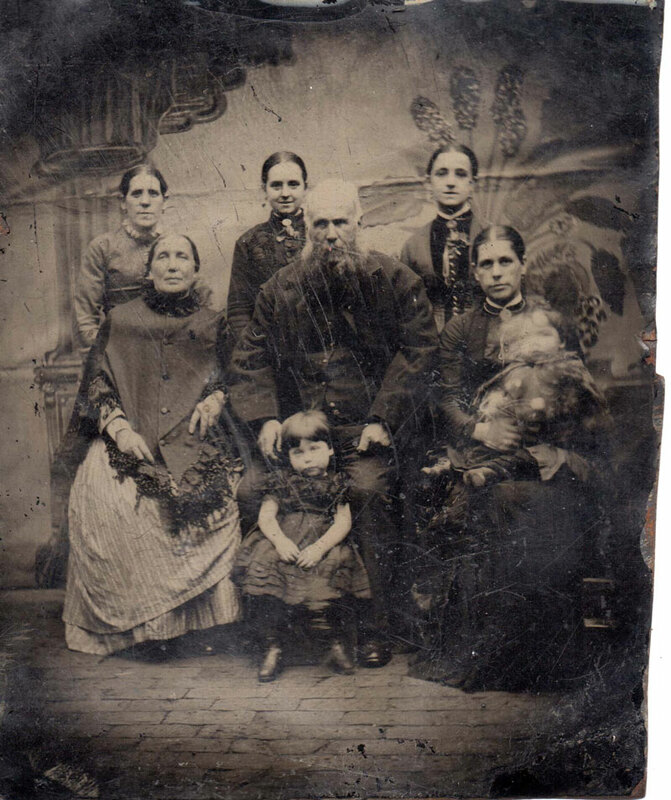 Upon first glance this family portrait appears to have been taken in formal studio but further examination reveals a crudely painted backdrop and a rough brick floor, suggesting that this was might have been an ad hoc set-up. The smallest child (possibly seated on an older sister’s lap) was unable to keep his or her head and hands still, and so there is significant blurring visible. Family in a horse and carriage. Unknown photographer. Date unknown. 6th plate tintype. Sheila Masson Collection. 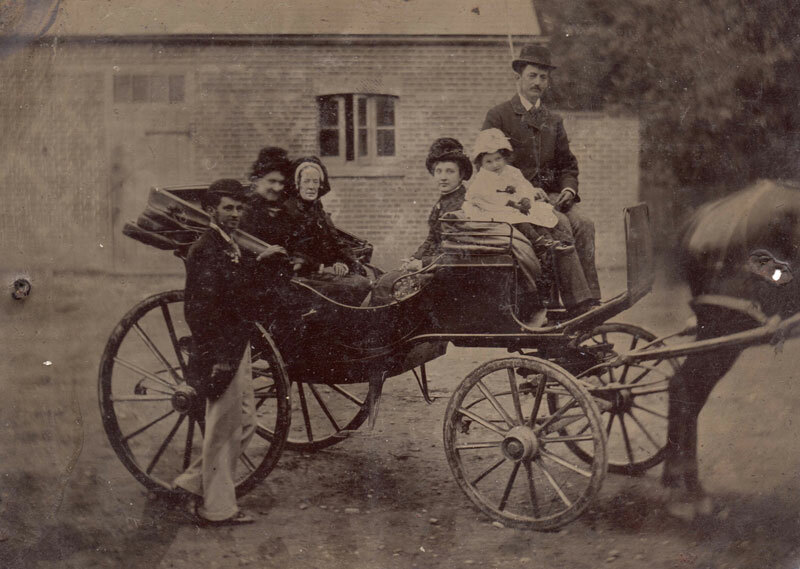 This portrait of a wealthier family seated in a horse-drawn carriage is unusual for a British tintype as the middle classes did not typically patronise tintype photographers (itinerant or otherwise). 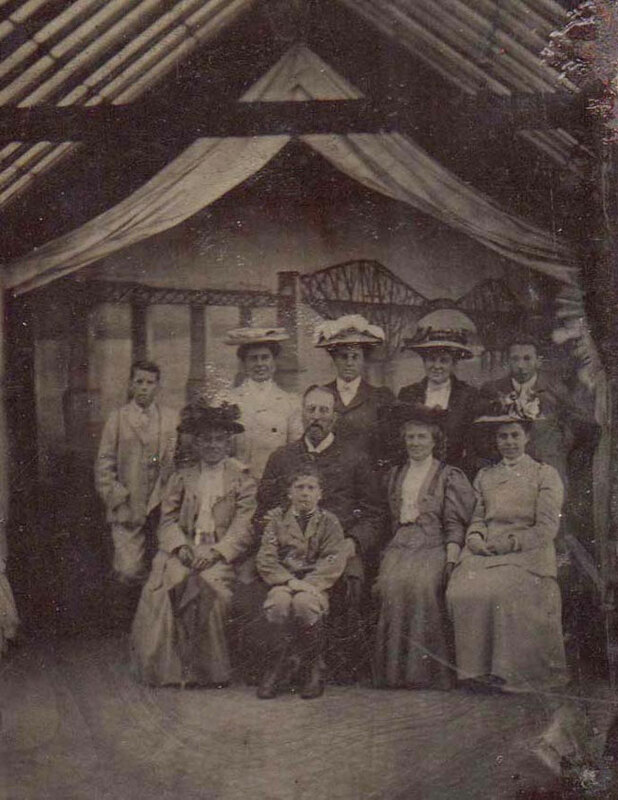 In the background is a large brick agricultural building, possibly part of a stable yard, which might also suggest that this photograph was taken on the family’s own land. Note also the holes unusually pierced on either side of the plate. Working woman with barrel. Unknown photographer. Date unknown. 6th plate tintype. Sheila Masson Collection. 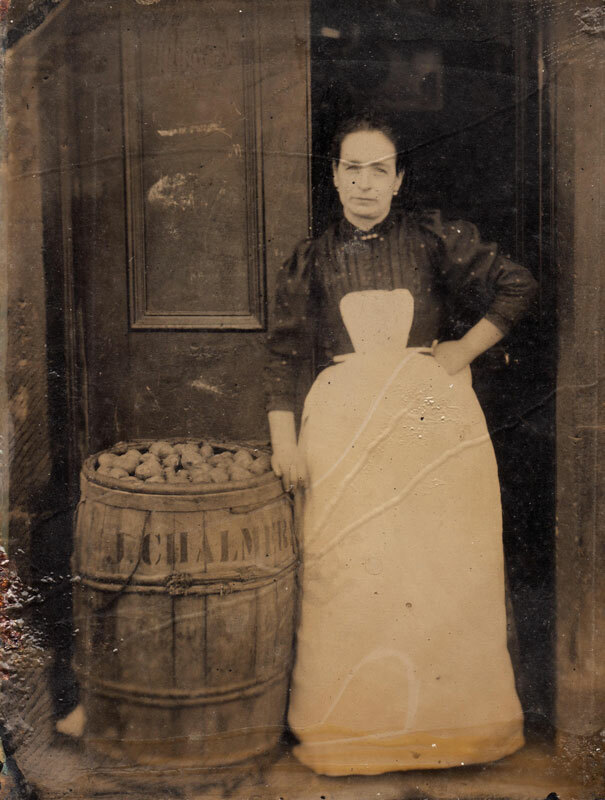 Tintype portraits of women were frequently taken in the doorway of their homes, businesses or workplaces, where they would have easily encountered itinerant photographers plying their trade, along with other daily visits from door-to-door salesmen or deliverymen. Heath tintype. Unknown photographer. Date unknown. 6th plate tintype. Sheila Masson Collection. Itinerant photographers prowled heaths and parks as well as beaches and streets in search of customers, sometimes incurring the wrath of local police and residents. This informal portraits of working class Victorians sprawled in a grassy locale reflects the growing opportunities for leisure time for all classes. Family in a Seaside Portrait. Unidentified photographer. Date unknown 6th plate tintype. Sheila Masson Collection. A very typical seaside portrait depicting a family at the beach. Oval marks are visible on the collodion surface where a brass mat has been removed at some point. Brass band member with euphonium, Unknown photographer. Date unknown. 6th plate tintype. Sheila Masson Collection. 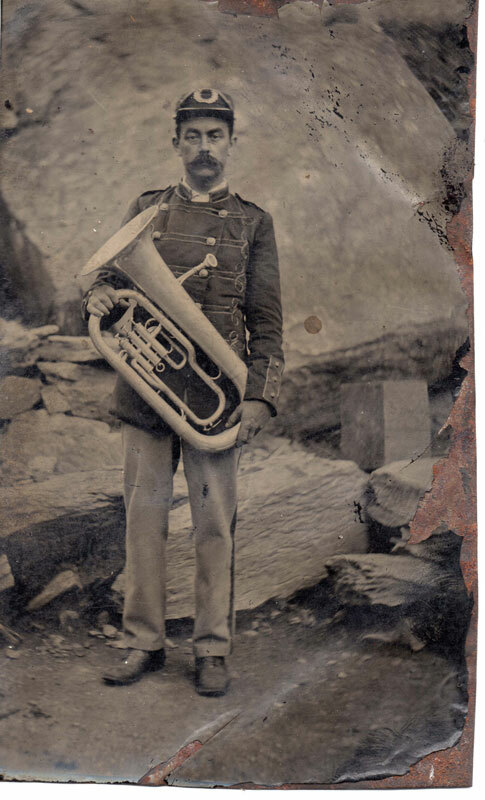 T This uniformed euphonium player is most likely a member of a large brass band, possibly affiliated to a quarry town in England or Wales. 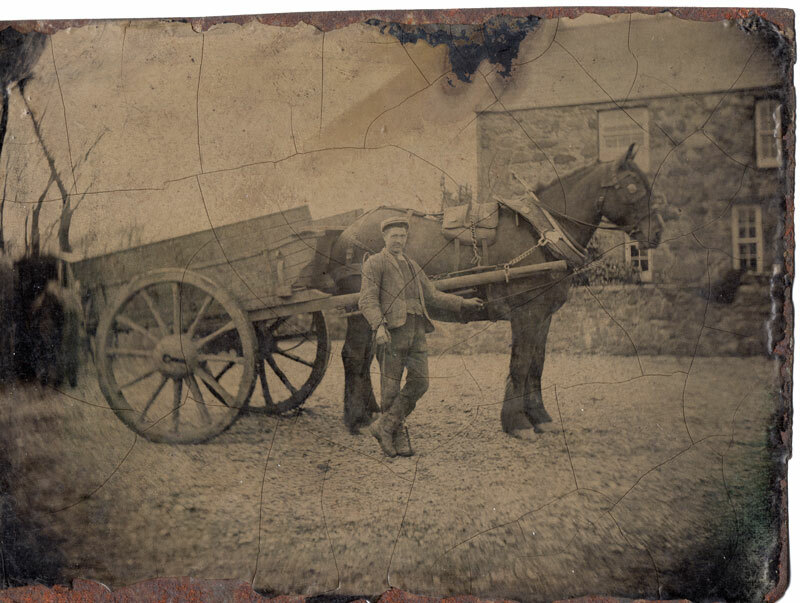 Agricultural worker with horse-drawn wooden cart. Unidentified photographer. Date unknown. ¼ plate tintype. Sheila Masson Collection.